← Yu’s New Beijing in Glen Ellyn Celebrates Father’s Day with a Special Menu! The origin of the fortune cookie, however, is not clear. What is certain is that the version of the fortune cookie we currently enjoy, stems from early 20th century California, with both Chinese and Japanese communities claiming its “invention.” One source suggests that Chinese immigrant David Jung, created the cookie, which included an inspirational scripture note, to pass out to the poor on the streets. Another source, however, credits Japanese immigrant Makoto Hagiwara, designer of the Japanese Tea Garden in San Francisco, who passed it on to all that helped him with the project and included a thank you note. What Americans know as the “fortune cookie,” is not a mainstay dessert snack in China or Japan. However, both cultures claim to have deep-rooted history where fortune-type cookies played a role, and which might have served as an inspiration for the American version. In 19th century Japan, tsujiura senbei (or fortune crackers) flavored with miso and sesame , larger in size but similarly shaped, carried the fortune note in the folded edge. Prior to that, in the 14th century, the Chinese hid secret messages inside Mooncakes, to help coordinate efforts that eventually overthrew the occupying Mongol government, giving way to the Ming Dynasty. 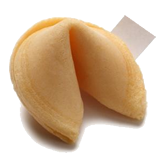 American fortune cookies gained popularity after WWII, remaining strong for over 70 years. Whereas the fortune message varies from bakery to bakery, some bakeries specialize in baking cookies with custom messages for special occasions. Others have created gourmet fortune cookies in different colors and flavors, and even dipped in chocolate. At Yu’s New Beijing , we will continue the Chinese-American tradition of including a fortune cookie with every meal. However, if you’re so inspired, here is a recipe for you to make some at home. Enjoy! Pour the vanilla into the egg white and mix until foamy. Fold over into a half circle with the message inside – Careful, as the cookies might be hot! This entry was posted in Chinese Dishes and tagged American, Chinese, Chinese Restaurant, fortune cookie, fortune cookies, FUN, Glen Ellyn, history, how to make, Illinois, Japanese, origin, recipe, Yu's New Beijing. Bookmark the permalink.